Obama targets the middle class while pretending to tax only the rich. A dominant theme of President Obama's budget speech last Wednesday was that our fiscal problems would vanish if only the wealthiest Americans were asked "to pay a little more." Since he's asking, imagine that instead of proposing to raise the top income tax rate well north of 40%, the President decided to go all the way to 100%. Let's stipulate that this is a thought experiment, because Democrats don't need any more ideas. But it's still a useful experiment because it exposes the fiscal futility of raising rates on the top 2%, or even the top 5% or 10%, of taxpayers to close the deficit. The mathematical reality is that in the absence of entitlement reform on the Paul Ryan model, Washington will need to soak the middle class—because that's where the big money is. 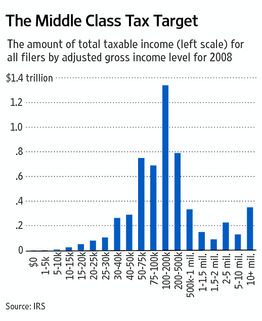 Consider the Internal Revenue Service's income tax statistics for 2008, the latest year for which data are available. The top 1% of taxpayers—those with salaries, dividends and capital gains roughly above about $380,000—paid 38% of taxes. But assume that tax policy confiscated all the taxable income of all the "millionaires and billionaires" Mr. Obama singled out. That yields merely about $938 billion, which is sand on the beach amid the $4 trillion White House budget, a $1.65 trillion deficit, and spending at 25% as a share of the economy, a post-World War II record. Say we take it up to the top 10%, or everyone with income over $114,000, including joint filers. That's five times Mr. Obama's 2% promise. 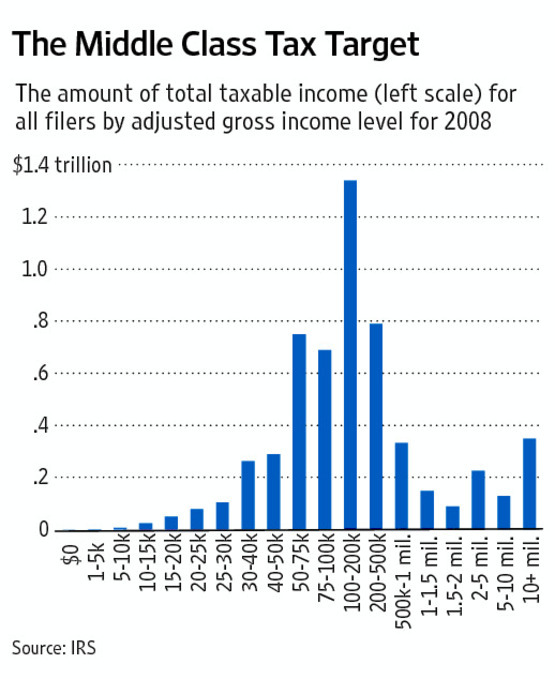 The IRS data are broken down at $100,000, yet taxing all income above that level throws up only $3.4 trillion. And remember, the top 10% already pay 69% of all total income taxes, while the top 5% pay more than all of the other 95%. In 2005 the top 5% earned over $145,000. If you took all the income of people over $200,000, it would yield about $1.89 trillion, enough revenue to cover the 2012 bill for Medicare, Medicaid and Social Security—but not the same bill in 2016, as the costs of those entitlements are expected to grow rapidly. The rich, in short, aren't nearly rich enough to finance Mr. Obama's entitlement state ambitions—even before his health-care plan kicks in. This is politically risky, however, so Mr. Obama's game has always been to pretend not to increase taxes for middle class voters while looking for sneaky ways to do it. His first budget in 2009 included a "climate revenues" section from the indirect carbon tax of cap and trade, which of course would be passed down to all consumers. Such Democratic luminaries as Nancy Pelosi have often chattered about a European-style value-added tax, or VAT, which from a liberal perspective has the virtue of applying to every level of production or service and therefore is largely hidden from the people who pay it. Now that those two ideas have failed politically, Mr. Obama is turning as he did last week to limiting tax deductions and other "loopholes," such as for mortgage interest payments. We support doing away with these distortions too, and so does Mr. Ryan, but in return for lower tax rates. Mr. Obama just wants the extra money, which he says will reduce the deficit but in practice will merely enable more spending. Mr. Ryan isn't proposing controversial entitlement reforms because he likes pointless political risk, or because he likes being berated to his face from a front row seat, as he was on Wednesday. Medicare and Medicaid spending are consistently growing two to three times faster than the rest of the economy, while Medicare's cash-in-cash-out financing model means that seniors collect far more in benefits than they paid in taxes over their working lifetime. The entitlement state was designed for another era. Mr. Obama's speech was disgraceful for its demagoguery but also because it contained nothing remotely commensurate to the scale of the problem. If the President had come out for a large tax on the middle class, like a VAT, then at least the country could have debated the choice of paying for the government we have or modernizing it a la Mr. Ryan so it is affordable. Instead the President will continue targeting the middle class for tax increases to pay for an entitlement state on autopilot, while claiming he only wants to tax the rich. Oh, and we almost forgot: Happy Tax Day.